Discredited as he was in Hollywood by 1934, there was still enough residual fame in Buster Keaton’s name to interest producers outside industry mainstreams. Europe was mad for our sight-gagging comedians and spent more to look at them than domestic audiences. 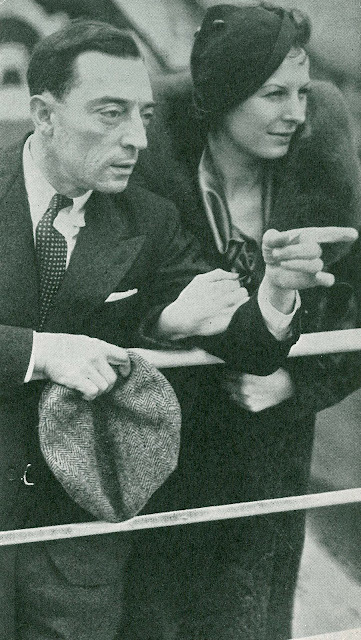 Chaplin’s foreign revenues were often leagues ahead of what he realized stateside, and Keaton was revered by French audiences whatever the reduced circumstances he’d come to on US shores. Euro producers came calling after dismissal from MGM left Buster unemployed but for a season of low-budget shorts at Educational. American majors might shun him, but starring feature work was but an ocean away (above is Buster shipboard with second wife Mae). Le Roi des Champs-Elysees was for Nero Films in France. It never had a United States release. There is no English language or dubbed version. William K. Everson used to run Le Roi on 16mm for his class and occasionally loaned the print to film cons. My seeing it was on one of those rare occasions. Le Roi is a must for Keaton purists. His voice is substituted by an inexpressive double, but there is so little dialogue as to make the switch unimportant. Buster was experienced with at least phonetic readings of varied tongues in Metro foreign versions he had done previously, so the comedian likely took a whirl at speaking French for Le Roi (lip readers say yes to that). Maybe producers decided as after-thought not to use his tracks, which is too bad because it would have enhanced the finished product. Le Roi floats among fans on DVD-R and each of them roll dice (or a ten-dollar bill) hoping copies scored off E-Bay or dealer tables will be watchable. The one I found turned out to be unusually nice, with overture and exit music (!). The feature runs not much over an hour. Buster performs routines traceable back to his silent shorts. He’s bound to have given plenty in a creative capacity, for much of the humor is unmistakably Keaton’s own. There is plenty of street shooting as well with pedestrians reacting to a prominent American clown in their midst. I'd like to think Buster was accorded respect by Le Roi's French producers, as Von Stroheim would be when he traveled there to do Grande Illusion. Keaton looks healthy and from all appearance seems to have bucked up from the Metro descent. Perhaps he was energized by co-workers who recognized his genius long before we would. 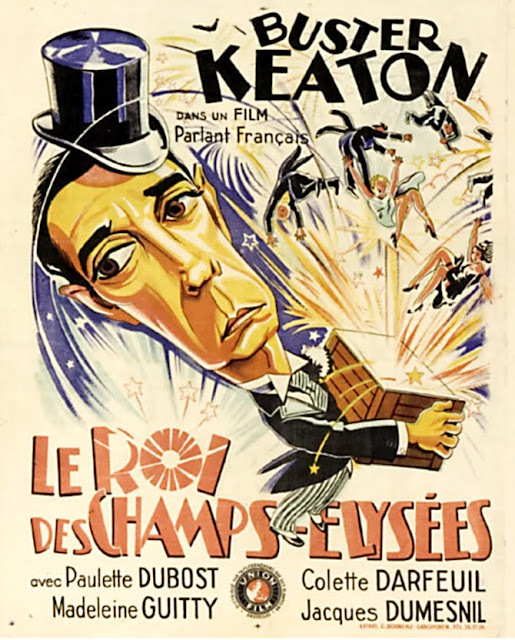 I’d say Le Roi surpasses then-recent Keaton features just for being his vehicle and not one to be shared with Jimmy Durante or other MGM comics (Polly Moran, Cliff Edwards). It was made for a price, but does not look so cheap as Educational shorts coming before and after. Effort and energy is clearly put forth here, by Buster plus those behind and in front of the camera. There is a music score throughout that really helps, and a nice payoff to what is actually a well-constructed little story. For lack of Hollywood polish, Le Roi is a bit raggedy at times, but it is no disgrace to Keaton, and he acquits himself nicely throughout. Too bad a US release was not forthcoming. Paramount seems to have handled it in at least some foreign territories, and doubtless considered distribution for here. Being they'd pass on Harold Lloyd’s The Cat’s Paw the same year, I guess the studio figured visual comedy was, at least for 1934, a dead issue. Another fabulous piece, this time about a film I have never seen and must now hunt down! It's always great to have a "new film" that I need to see. Thanks for the heads-up! Thanks for the kind words, Tom. Le Roi is well worth tracking down. Wish I could point you in the direction of where I got mine, but it was at a show, and I can't even remember now who the dealer was that sold it to me. I think I will be able to find it somewhere. This film was produced by the German company Nero, and it was released in Argentina by a company called Cinematográfica Terra that, before WWII, it concentrated in European films back to the silent era (the full surviving version of METROPOLIS was distributed by them). Around the beginning of the war it became an Argentine film production company before it was disolved. Very cool photo of Tyrone Power as Eddy Duchin, John. They had re-issued it in Beverly Hills sometime during the sixties. As a very little boy I went to see it on a Sat. afternoon -- because Columbia had double-billed it with "Pal Joey" -- which was the one I had wanted to see! After that, everywhere I went in the Beverly-area, young girls kept coming-up and asking for my autographed! (Seriously!) They were all convinced I was young Rex Thompson who had played his son, Peter! (We were evidently look-alikes at that time!) Never one to dissapoint people, I of course accepted the deception with aplomb, I guess one might call it. To this day, even members of the Tyrone Power Group have no idea what's become of Rex Thompson. My guess is, he saw the picture again, changed his name and went into permanent hiding! I think Rex Thompson had a big following in Italy-I believe I saw him on an Italian variety show playing piano as part of a tribute to "the Eddy Duchin Story"
RJ, that Eddy Duchin image came off the jacket of a soundtrack album for the film. I found the record last week at a breakfast joint in Cherry Grove Beach, South Carolina. Got it for a dollar. The jacket photo was worth that! bshaffer, I'll bet that Le Roi DVD was one of yours, as it's really nice and I know Bruce Lawton to be one of the real experts on classic comedy. I've recently been enjoying his audio commentaries on the new "Becoming Charley Chase" set. Hi. Where can I get a decent & complete copy of "le Roi des Champs-Élysées" ? I've been looking for a copy for a while now, but the lack of informations and review(s) of the transfer kept me from jumping in.